One strike against technology-based artwork is that it’s notoriously difficult to get to work correctly, as was the case with Julius Popp’s Bit.Flow MK2 at the Dogenhaus booth at Volta. Since we’ve been fans of Popp’s previous work, we stopped to talk to the dealer and find out what exactly we weren’t seeing in its fully functioning form. Popp’s work sits right at the intersection of programming and engineering. He writes programs to scroll the internet for key words that contribute data to his mechanical systems that use materials to illustrate those patterns through ephemeral messages displayed or transmitted via custom-built machines. Amid the tangle of clear tubes on the floor, in theory, a pattern emerges if you’re standing in a certain position in relation to the tubes. The conceptual beauty of Popp’s work is undeniable — from releasing buoys into the ocean that transmit positioning data back to their owners, to droplets of water forming into words as they fall, to tubes that traffic messages from the ether. Yet art is ultimately a visual endeavor, and must present its case to the eyes in order to persuade the mind. If the viewer is left to imagine how something works with the guidance of a weighty statement, she might, in her imagination, greatly improve upon the concept. 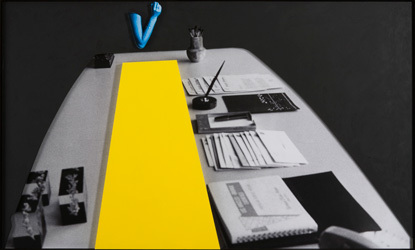 Julius Popp is represented by Dogenhaus Galerie in Leipzig, Germany. We met our friend and gallerist Myrtia Nikolakopoulou in New York: she was in from Athens and, although she’s quite widely traveled, it was her first time in the States. We asked about her impressions (noting that it’s quite unfair to base any experience of this country solely on NYC). She was surprised at just how open and friendly Americans are (in the art world? really? : yes, she said, you should go to Basel if you don’t believe me). 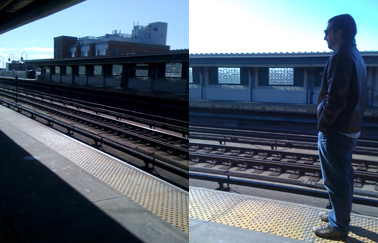 But she also noted that it must be very stressful to live in New York City, because it is so business-oriented. Although everyone’s friendly, they’re always working. In Europe, she said, people take time off to enjoy life. Yesterday I ran across a review of some of the working habits of the world’s most successful people. Interestingly enough, most of them spent a lot of time relaxing, worked much fewer hours, took afternoons off. There’s something to be said about the over-professionalism of the American art life. 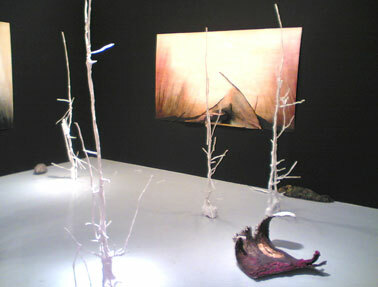 That’s how we end up with the polished, friendly work so popular at art fairs. Maybe we need to take a break, take a breather, take some long lunches, linger a bit, let our minds drift. We’re on our way to New York to meet up with Myrtia Nikolakopoulou, our gallerist, and curator Sotirios Bahtsetzis for a weekend of fair-hopping. 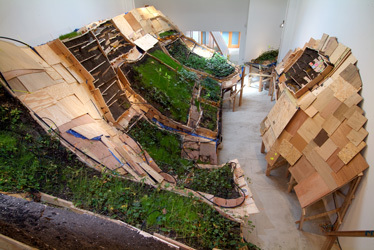 Also on the docket: the Biennial and Cai Guo-Qiang. We’re also planning on catching the art-blogging panel at Red Dot on Sunday. We’ll blog throughout the weekend. It’s not often that performance art surprises and challenges my assumptions. Call it an unfair bias from a former performance artist who has given up the medium in favor of video, a decision that was many years and conversations in the making. The state of performance in the 21st century is lukewarm at best, rife with reheated investigations of body, gender and otherness: conversations that were so elegantly explored in the heyday of the 1960s, 70s and 80s. Even performance artists like Chris Burden and Vito Acconci have moved on to more diverse pursuits, like bridge-building and utopian architecture. It’s a daunting challenge to make live performance relevant in this commercial, object-oriented art world, and yet: there is Tino Sehgal, at a 57th street blue-chip gallery, with no props, installation or costumes, breathing new life into the genre. 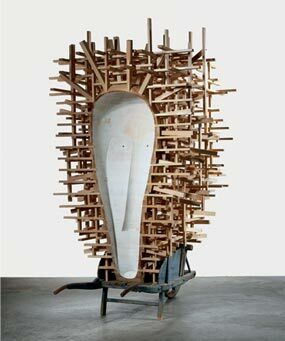 Sehgal’s performance work, This situation, like the best conceptual art, is held up on the ephemeral scaffold of a simple good idea, well executed. 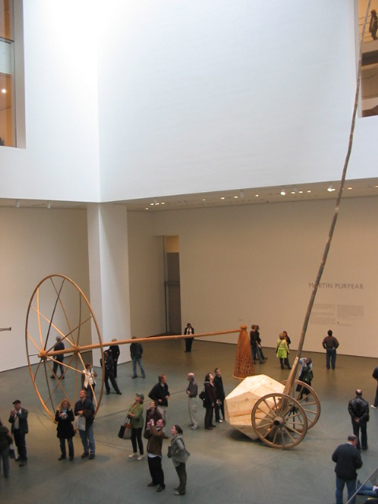 In short, six “players” working in 4-hour shifts, gather in a gallery to engage in conversation. 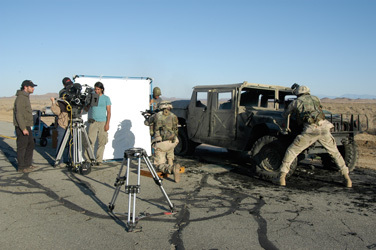 As viewers enter the room, the players greet them with the musical drone “….welcome… to this… situation,” and then change the subject of conversation. 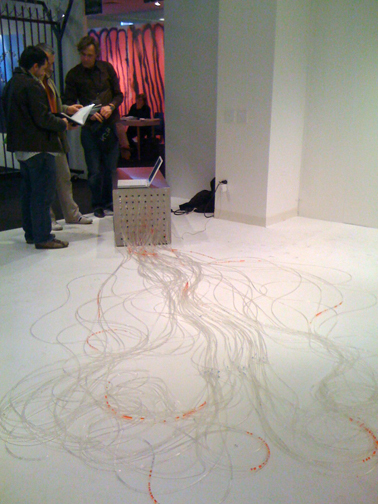 There is a choreographed formula of tai chi-like movement that shifts the players around the room, and each new conversation begins with one of the players reciting a challenging quote that, during the time we were in the gallery, ranged wildly from philosophy to economics to personal phobias. 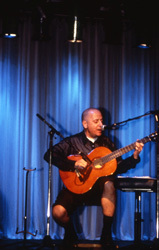 Here’s what is different about this piece: the performers themselves are empowered to create fresh content, but under heavy artistic direction; audience interaction is accepted but unnecessary; and the performers are equipped with enough formula to keep the piece on-track regardless of any unknown variables. 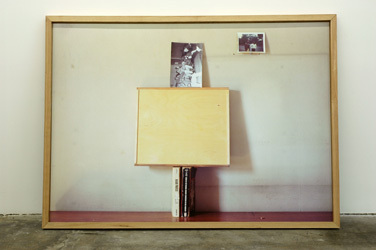 Unlike the “happenings” of yesteryear, where the audience itself was often the performance and anything they might do unawares might become the artwork’s content, Sehgal’s elegant and utterly postmodern work has both the precision and the agility to modify meaning based on the specific slice of conversation that the viewer happens to interrupt. This situation speaks to the contemporary zeitgeist with such persuasion that it might, in fact, make great strides towards reinvigorating that old medium of live performance. 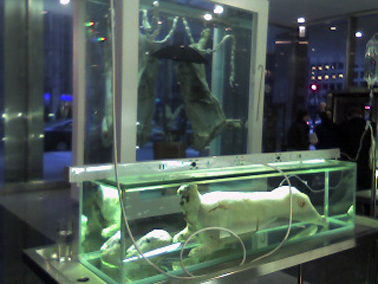 It never fails: the first thing I think when I see a Damien Hirst is — sheesh, that’s a big budget. The scale of his work is mind-boggling, and the commission he made for The Lever House, School: The Archeology of Lost Desires, Comprehending Infinity, and the Search for Knowledge, boasts that swagger that’s made him a superstar. 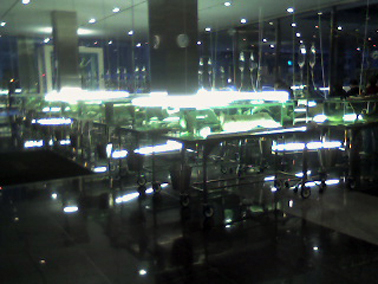 The installation is a “school room” of glass tanks full of sheep carcasses attached to hospital hoses with a single shark and some live canaries among them. 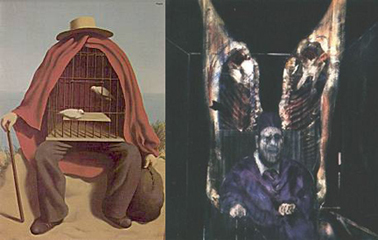 Leading the “class” is a large tank containing two sides of beef, an umbrella, birdcage and an armchair — direct references to the Francis Bacon and Rene Magritte paintings below. Damien Hirst’s School… has more conceptual density than some of his other work, and this is not a good thing. There is so much going on — rows of dead sheep, live birds, an operating room’s worth of medical equipment, ashtrays under every object, clocks running backwards, stacks of sand, a paragraph-like title — that his poetry becomes belabored. The two works Hirst references have no need for spelled-out exegesis. Those great painters both allow their subjects to breathe, to have some wiggle room, and to ultimately work out their concepts in a sensitive, interior dialogue in which only the most interested viewers might engage. If only Hirst could have learned that same lesson under their tutelage. 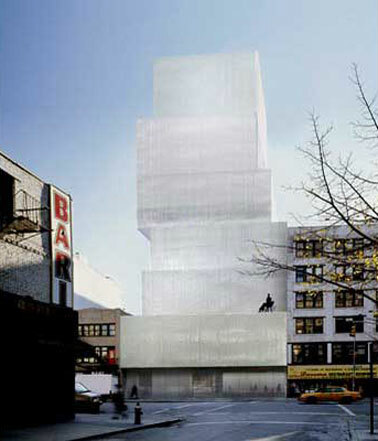 The New Museum of Contemporary Art’s new building and location opened a couple weeks ago in NYC and I’ve been looking forward to seeing it and their inaugural exhibition, Unmonumental: The Object in the 21st Century, which runs until March 23, 2008. My expectations were high: with a four word, to-the-point mission statement–new art, new ideas–and an mysterious exterior designed by Tokyo-based architects Kazuyo Sejima and Ryue Nishizawa/SANAA [with Gensler, New York, serving as Executive Architect], I’m sure I wasn’t the only one. However, as is the case just about every time I enter an experience with high expectations, I was disappointed with both their new building and their first exhibition. What’s impossible to ignore about the building is that it’s designed for one person to use at a time. Stairwells–which are unavoidable due to the sole elevator’s small size and slow speed–and hallways are only wide enough for one person. Museum visitors awkwardly negotiate paths with each other while grumbling. On top of that, the details betray a too-small budget: stair railings seem residentially-rated and the lobby ceiling seems borrowed from a mall. 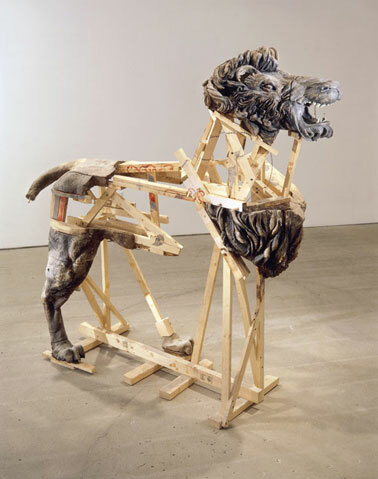 Unmonumental has its gems like Kristen Morgin’s Lion and Elliot “I can do no wrong” Hundley’s fragile paper sculptures, however much of the work does not seem new or contain new ideas. To anyone who experienced the Hammer Museum’s Thing sculpture exhibition in Los Angeles a couple years ago, Unmonumental might seem conventional and, well, trendy. That said, it’s not everyday that a new museum opens and in particular it’s not everyday a museum opens with such a forward vision. They will receive a lot of criticism because their audience is loud and has unreasonable expectations, but they will survive and I can’t wait to see what they do next. 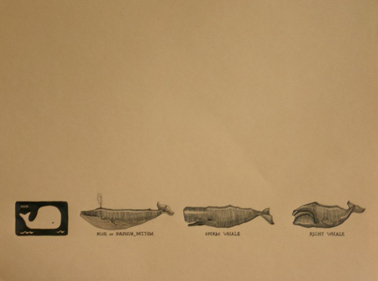 All the Whales, 2004, Emily Prince, Graphite on vellum, 19 ½ x 22 ½ in. It’s not a bold statement to say that artists are close observers, so an exhibition organized around artwork that studies and analyzes the surrounding world faces the steep challenge of saying something new in the process of its examination. Kent Gallery’s current show in Chelsea, Close Looking, tackles this theme by highlighting the work of six of the gallery’s artists. From Dennis Adams’s four-channel DVD installation, Seize, which observes a rock-wall climber’s ascent up the Walker Museum’s facade via cameras attached to his ankles and wrists to Emily Prince’s folksy drawings of various seemingly random groupings of images and objects in her own home, Close Looking looks closely at the everyday world without its context to reveal subtle patterns and orderings that might, otherwise, pass un-noted. Of all the work in the show, Heide Fasnacht’s drawings take observation and reorganization one step further to reveal the structure beneath the eye’s very act of observing. 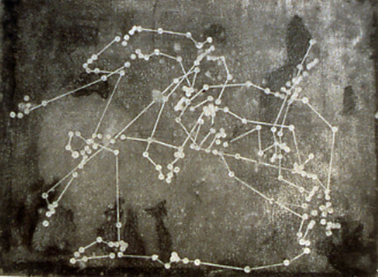 Based on the work of Robert L. Solso, a cognitive behavior scientist from MIT who devised a machine called the eye-tracker to record people’s eye movements as they scanned a painting, Fasnacht’s R.E.M drawings track the eye movement associated with Seurat’s Les Poseurs. By using a painting by Seurat, an artist also interested in the way that the eye breaks down images, Fasnacht adds another layer to the work. While Close Looking doesn’t venture into new curatorial territory, the show succeeds in unifying a diverse group of artists by virtue of a skill that informs all their various explorations. 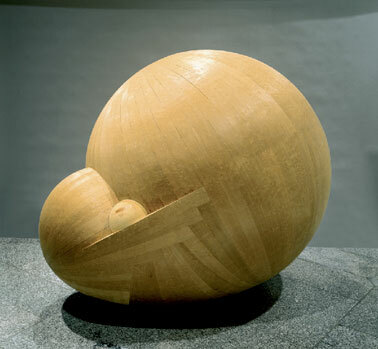 A triumphant intersection of concept and craft, Martin Puryear’s retrospective at MOMA includes work from the last 30 years and is on view through Jan 14, 2008. 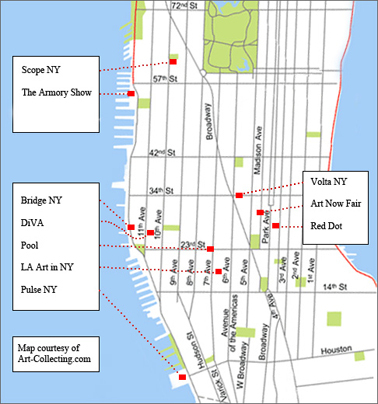 If you work with wood, now is a great time to visit New York. It’s the best of the Romantics, like Caspar David Friedrich, who show us that it’s possible to strike an emotional chord with just a few trees, a horizon line, and some mysterious shadows. Kim Krans, in her installation at D’Amelio Terras, I stood in the forest and felt nothing, shares much in common with the work of Friedrich. 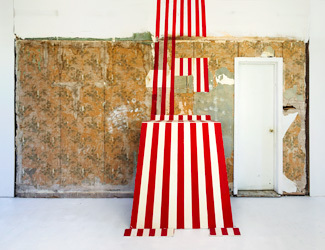 Trees, both plaster and painted, horizon lines, shadows, wisps of clouds, and rocks amid deserted structures work in concert to create a somber meditation on memory and loss in Krans’s installation. Like Friedrich, Kim Krans reminds us that in capable hands, landscape can make meaning that carries beyond its own borders. 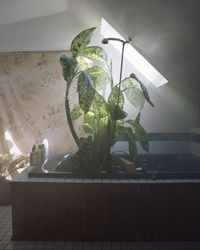 Kim Krans: I stood in the forest and felt nothing.